Greatly appreciated by consumers, especially because of its innovative, avant-garde tilt device, the HORIZON model is an essential automated spa solution. 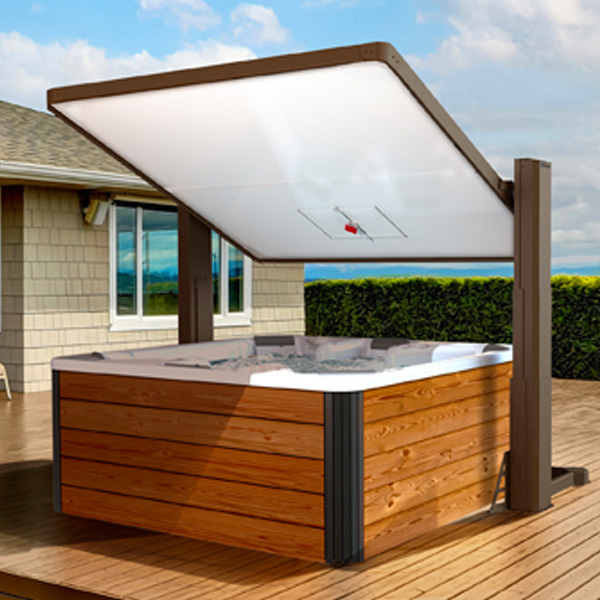 Whether you’re gazing at the stars of the evening sky or relaxing while you enjoy a daytime panoramic view, the HORIZON model lets you benefit fully from your spa while protecting you from the sun’s rays and bad weather. The unique features of the HORIZON model make it an essential solution for homeowners who want a distinctive outdoor layout, including installation of a spa that will impress with its luxurious, avant-garde look. As in the case of the LEGEND and EVOLUTION, the HORIZON spa cover and gazebo will now be available on request in two matching panel colours: Latte and Platinum. To mark its return to the market, COVANA offers a choice of colours at no additional charge on the first 100 units ordered.